How about some sweet and sour prawns to go with your noodles or rice? Prawn recipes are very easy to make because the cooking time is less and flavors are more. They are very nutritious. So all in all, a very profitable deal. 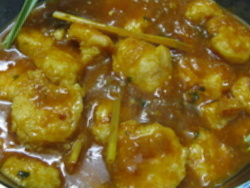 This is a Chinese recipe for prawns cooked in a sweet and sour sauce . Hope you will like it. Place the prawns in a bowl and add all the marinade ingredients. Mix well to coat all the prawns. Marinade the prawns for ½ an hour and then deep fry for 1 minute and drain on kitchen paper. Add the prawns one by one in the oil to avoid them sticking together. In a pan heat the oil and fry the onions and ginger garlic paste till brown. Add the rest of the ingredients (from the ingredients list up till salt) and saute. Tip in the prawns, stir gently. Add the hot water and mix well. Immediately add the corn flour paste. As soon as the sauce thickens, turn off the heat. Garnish with coriander leaves and serve. Kindly Note-If you want you can also put some shelled onions and a green capsicum (cut in 8pieces), in the gravy just before adding the prawns. Cook these till the onion shells become glassy. Then continue with the recipe. Taste the sauce and add more sugar if needed. The sauce should taste sour but also little sweet to balance the flavors.